All pictures and text on this site are copyrighted ©1982-2019 Alex Peck. All rights reserve. Bloodletting remained a popular medical remedy for all sorts of ailments during the nineteenth century. 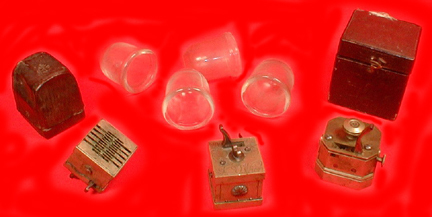 Here are three multi-bladed mechanical scarificators and examples of bloodletting cups that were used with the scarificators. When wet cupping, the skin surface would be cut with a scarificator and cups would be applied. A vacuum would be created within the cup by exhausting the air, either by a flame or by a pump, and with a tight seal formed against the skin, the blood would be drawn into the cup. Dry cupping used the same idea for creating a vacuum within a cup, but a scarificator was not used and the skin was not broken, so no blood actually flowed into the cups. The square-shaped scarificators to the left and center are typical of early nineteenth examples from Austria and Germany. The octagonal-shaped scarificator to the right is typical of ones from America and England. Two of the scarificators have their original pressed-leather cases. For additional bloodletting instruments and other medical antiques, visit the various sections of this web site.